Description: It is made by handmade leather. Size: 12inch x 9inch x 4 inch. It is also available in custom size, color and designs. Description : It is 100% handmade leather bag. And it is Stamped with design on leather. There is four portion in the bag, and one zip packet. And closed with magnetic button. It is also available in different design and color. 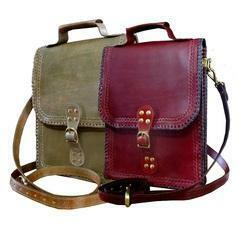 Looking for Handmade Leather Messenger Bag ?